From Sarajevo to Mostar in Bosnia. I departed rainy Sarajevo by bus to gaze in awe at the beautiful landscape down to hot sunny Mostar. The Balkans continually bedazzles my vision with its ultra enchanting mountains, canyons, lakes, and rivers. Bosnia in itself is a wonderful country to travel; there are some major cultural discrepancies from the south including Bulgaria. The most predominant attribute is that the females are approachable, intelligent, and will converse within a normal relaxed fashion. And, considerably less flamboyant than in the south; all the girls are aware of the flamboyant extreme self-centeredness in the south with a high percentage of women that dress like prostitutes. I am really enjoying the energy and disposition of the girls here in Bosnia. 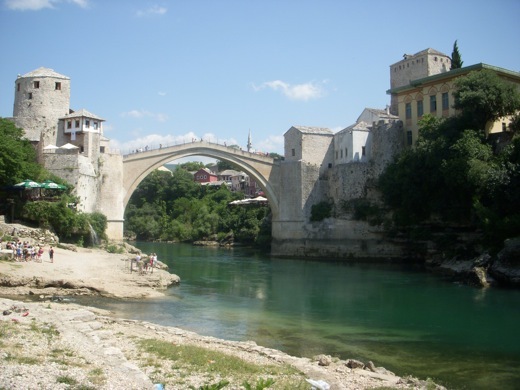 The Old Bridge of Mostar! Please note: people can choose to present themselves as they wish. My writings consist of comparing the dynamics of cultures and influences that are within the framework of the embedded cultural mind. Rolling into to Mostar, the divided city that experienced fierce fighting during the Bosnian war, a lady approached me at the bus stop inquiring if I need a room. There were other tourists/travelers that manifested a defense upon being approached. Traveling this year of 2010 I made several changes through the surrendering deep ingrained control and defensiveness; observing others defensive mind-set a simple task. The lady is a pleasant accommodating person—her flat is wonderfully relaxing, she even washed and ironed my clothes. I am only paying 15 Euro a night, but wired to the Internet. 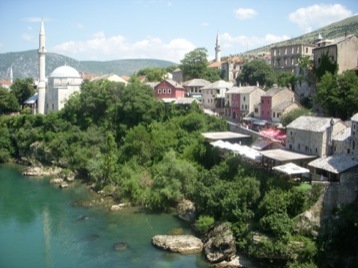 Staying in a home such as in Ohrid and now Mostar outweighs a hotel or pension one hundred percent. Openness is critical to defeat in-bred cultural defensiveness that is implanted from the parent ideology, media delusion, and the travel industry. The Old Bridge from Below. Ironically, I have been approaching travelers/tourists that will refrain to even say hello. Many people are not willing to take even five minutes to converse within an amiable manner. I will comment that it is ‘OK to be friendly’ and most just walk off into their tourist delusional frame of mind. I realize this sounds negative, but this non-friendly, moving along defensive nature within a fast pace is an affirmative observation. Long term travelers will recognize the shallow element of “site seeing” and seek to deepen their travel interest and style. 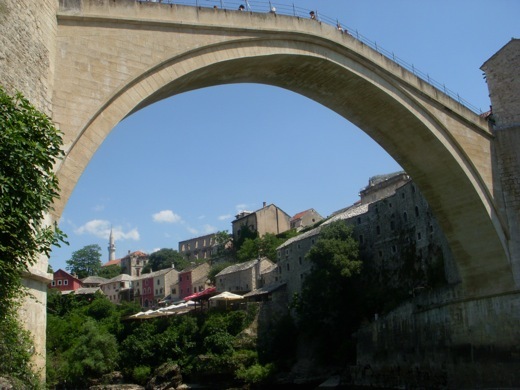 Next post: The Former Front Line of Mostar—Bosnia. Previous post: Rainy Sarajevo with American Tourists, and a Slight Change.